Every time we got to New York, there's a great little Italian place we go to that has a dish made of hot cherry peppers. It's absolutely divine, and we always make sure to freeze a couple of containers to carry home with us. We got home, August 04, and I was completely craving the stuff, so I thought we'd hop over to the store and pick up a couple bags of cherry peppers and make it ourselves. Well, needless to say, we didn't find them. We've been searching for a couple of years for the real thing, with no success. We found them pickled in a jar, but the only thing we could reliably find were the sweet cherry peppers. Being the gardener that I am, I decided that it would make a lot of sense to grow them, so I began searching for seeds. I ordered seeds and was very excited about the entire thing. 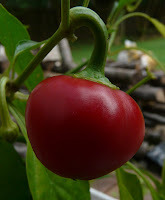 When the first pepper was ready, we picked it, took it inside, sliced it up, and tasted it. And were disappointed. It wasn't hot and tasted more like a bell pepper with a bit of spice. Yuck. And so it continued. I ordered seed from a couple more sources, made a handful of trades, and got nothing close, until the last trade I made. I got one plant out of about 25 seeds, and I blamed it on being sent old seed or poorly stored seed. The single plant was spindly, puny, and produced one pepper after 4 months, and it wouldn't have survived, had it not have been one of about a million plants in my pepper patch that year. We were in the kitchen, doing our daily slice and shrug, and we got to the puny pepper, as we called it. It was what we'd been searching for! This pathetic little plant produced the single pepper that was what we were searching for. I took all of the seeds, sowed them, and waited. And waited and waited and waited. Out of the 20+ seeds I sowed, only three showed their faces. Very poor germination, and I was pretty disappointed. The plants were less than robust, but they produced alright. Far from enough to grow the massive amount of peppers I craved. And then I got to thinking...you know, the sweet pepper gene isn't dominant. I wonder if I could breed a sweet pimiento to this pathetic hot one and get something better. Needless to say, I'm currently at F bazillion, and the three current plants are loaded with peppers. I think we've found a winner! It's still a pretty puny plant, but it's better and the pepper hasn't lost any of the heat, taste, or texture of the original pepper. Four years and three thousand peppers later, it's the plant I've been wanting. I'll probably play with the crosses some more, but I'm satisfied with the current result. Next year, I'll plant a large plot and have a handful of other generations going on the patio, and my dream of handfuls of peppers will have come true! Thanks for sharing: save those seed! That is a great story! Thanks! i'm planning on buying a few seeds from your etsy store. Is there anywhere i can find a few tips on proper care?